When we last saw our heroes over at How It Should Have Ended in Part 1, Ultron had destroyed the entire world except for Batman and Superman. So with no other choice, Superman reversed time to avert this tragic disaster. Well now How The Avengers: Age Of Ultron Should Have Ended (Part Two) is out, and it picks up right where we left off! Why? Because he’s BATMAN! One of the biggest thing about Avengers: Age Of Ultron is how easy many of those scenes and battles would have been if they had their full universe to work with. Most noticeable was how the train scene seemed exactly like the scene from Spider-Man 2. Sadly, “Your Friendly Neighborhood Marvel Universe Spider-Man” won’t be introduced until Captain America: Civil War. Similarly, the X-Men: Days Of Future Past references were everywhere. From the MCU Quicksilver redirecting bullets like his DOFP counterpart to Magneto appearing to effortlessly crush every Ultron bot and proclaim Scarlet Witch and Quicksilver his “Mutant” children, the crossovers here were spectacular! 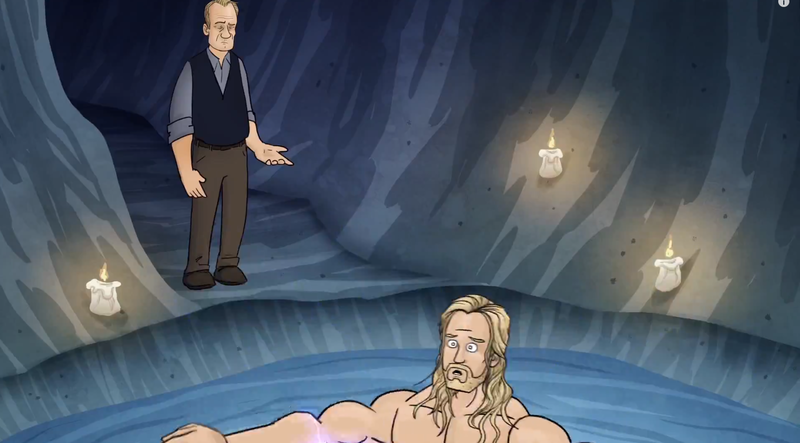 As for the “cant help but feel like something is missing” moment, this is what most people felt while watching the whole ‘Thor bath’ scene. It did seem very rushed and disjointed from the rest of the film. Well that’s because there was originally much more to it; however the majority of it was cut out in the interest of saving time. Though the biggest way how The Avengers: Age Of Ultron should have ended was if Vision, Ironman and Thor continued their final attack on a melting Ultron. If they had finished the job, he’d have never taken the Quinjet and thus never shot Quicksilver, which would mean that Scarlet Witch never left her station allowing an Ultron Drone to crash Sokovia. Come on heroes, follow through! Of couse it’s not a How It Should Have Ended without a visit to the Superhero Café where we find ALL the Avengers with Batman & Superman, who point out that Vision is kind of a Superman-esque character – purely good, lasers, similar colors. Though the ever intelligent Vision simply turns this around into some good ole Batman v Superman action – where we find Batman still trying to goad Superman into a fight – a recurring theme in Superhero Café clips. In the end though, all agree with Captain America that there shouldn’t be a “Civil War” except Ironman – a joke about the Captain America vs Ironman dynamic of Captain America: Civil War. O Insightful Panda! Can you explain why, in Ultron, Hawkeye couldn’t be messed up by mind control? I don’t know much about the character. Recall that Hawkeye was brainwashed for most of The Avengers. So he knows the signs and feel, which is why he was able to quickly stop Scarlet Witch and say “Not again”. Remember his mind messing was from the Mind Stone, as are where her powers come from. This isn’t to say he has an ‘immunity’ to it, because the Stones are far too strong and this one hasn’t even been used to its full potential yet. Though between his discipline and prior experiences, this is why he’s able to sense the initial tampering and stop it before it’s too late.